The White House has handed out copies of President Obama’s long form birth certificate from Hawaii to the media. The president will talk about his birth certificate in a White House statement. The certificate, released Wednesday and available on the White House blog, says Barack Obama was born in Hawaii, which makes him eligible to hold the office of president. 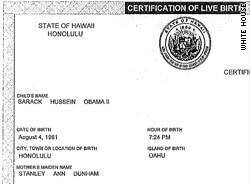 President Obama had earlier released a standard short form, but requested copies of his original birth certificate from Hawaii officials this week.